Q. 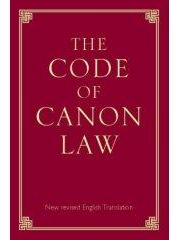 8: Shouldn't we accept the 1983 Code of Canon Law? But Vatican II adulterated Catholic teaching. We must, therefore, suspect the new legislation of codifying the same errors and so be ready not to accept all its “laws,” [principle 9] but only those which do not evidently compromise Catholic teaching on faith or morals. For the most part, we may regret the loss of clarity, precision and integrity the 1917 Code of Canon Law had, but that is insufficient reason to reject these canons. Canon 844, §4 allows the administration of penance, anointing of the sick, and even holy communion to non-Catholics who manifest “Catholic faith” (vs. principle 7) in these sacraments. This used to be considered a mortal sin and was gravely forbidden (1917 Code of Canon Law, canon 731, §21) because it implicitly denies the dogma, “Outside the Church, no salvation” (principle 2). This is an inadmissible surrender to modernist ecumenism. Hence grave doubts are to be held concerning the annulments issued by Novus Ordo tribunals. This collegiality tampers with the divine constitution of the Church, derogates from the pope’s powers, and hampers his government of the Church (and that of the bishops in their dioceses). “episcopal conferences” now assume authority, which thus becomes impersonal and unanswerable. In passing, it is interesting to note that for Pope John Paul II the 1983 Code of Canon Law has less weight than a conciliar constitution.